A PCB (printed circuit board) D-sub connector is a type of electrical connectorthat has built-in solder points for easy mounting on a PCB. 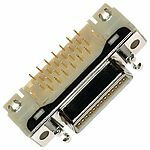 This type of connector is suitable for a range of uses including military, industrial and commercial applications and in computer interfacing. PCB D-sub connectors usually have a housing made from strong thermoplastic and a steel- or tin-plated front shell. They also have several pins which are used for the electrical connection and can be mounted to your printed circuit board using solder. PCB D-sub connectors have a D-shaped shell that's mainly used in video connections in the computing field, for example between a monitor and a PC.